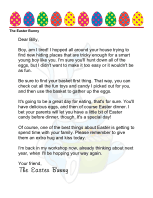 This printable letter from the Easter Bunny reminds the recipient of the wonder of Christ's resurrection on the third day. Happy Easter! 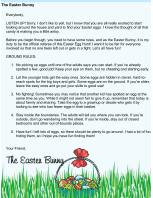 I hope you have fun hunting eggs, eating chocolate (yum!) and enjoying the day with your family. And what a special day it is! I'm sure you've heard many times, at church and from your parents, the story of Jesus Christ's resurrection. It's amazing to think of the tremendous sacrifice he made. Imagine what His believers felt when he rose again on the third day! Whether you go to church Easter morning or not, I hope you take a moment to remember what the holiday is all about, and how we set aside this time to remember that He is Risen. 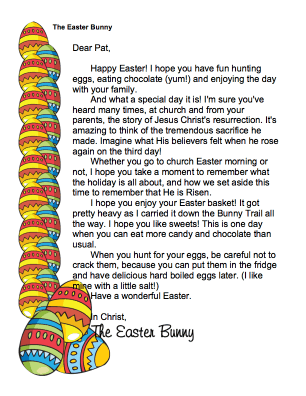 I hope you enjoy your Easter basket! It got pretty heavy as I carried it down the Bunny Trail all the way. I hope you like sweets! This is one day when you can eat more candy and chocolate than usual.